in or to what place or position. at, in, or to which (used after reference to a place or situation). "I first saw him in Paris, where I lived in the early sixties"
the place or situation in which. "this is where I live"
"do you see where the men in your life are emotionally unavailable to you?" second person singular past, plural past, and past subjunctive of be. 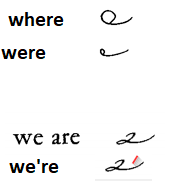 I couldn't find the contraction for "we're" in Anniversary, so I'm guessing it would be the same as "we are" but with an apostrophe. Sometimes you want that exact, depending on the wording and person you might be transcribing for (trust me, I had a director who wanted exact minutes, including comma's in a certain area that may or may not have needed them).